1. Did I catch the look and feel of a basic Oakeshott Type XII? 2. I know the medallion is too small, and feathers are exaggerated. I did employ artistic license, especially in the decision to use leather gloves, rather than mail mitts. 4. I participated in a discussion about the use of crests on helms. I decided to use a crest and 13th C. veiling. From what I have read here, rolls were not yet in use in the Mid 13th C.
GO FOR IT, PEOPLE! I NEED SOME CONSTRUCTIVE CRITICISM. Not quite. The triangular tip (caused by a hard angle of the blade edge to the tip) isn't typical at all. 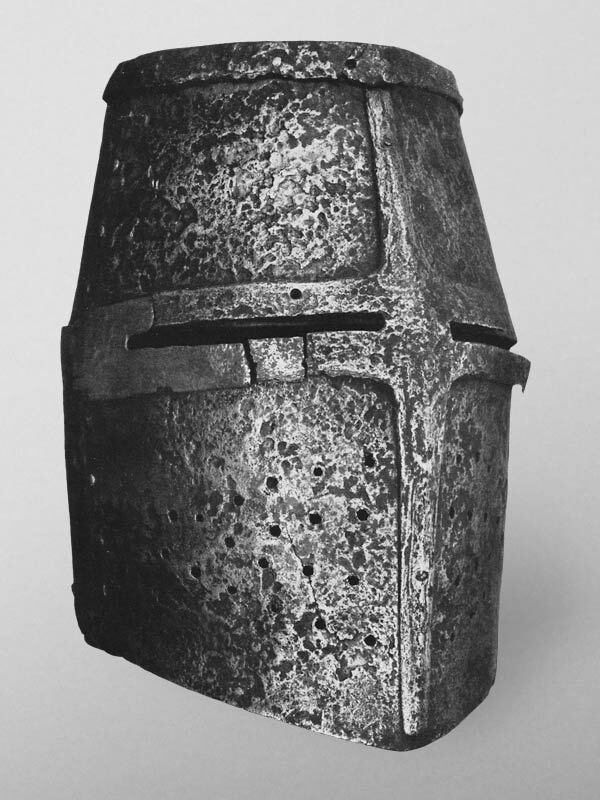 My avatar is a a great helm from the mid 14th century (c, 1350), about a century too late for you. The form of your helmet is, in general, not very historic at all, especially to the period in question. If the crown of the great helm tapers at the top it begins to do so at the junction somewhere around eye level. In fact, the sights are most often formed at and by a juncture of plates, so having the sights cut out of the front plate, having a line of rivets above eye level, and the taper beginning there is not anything I've seen on a historical helm. For a mid 13th century helm, look at period artwork like the Maciejowski Bible, drawn circa 1250. There are no surviving helms from the mid 13th century, so artwork is your best bet. Posted: Sun 12 Dec, 2010 3:57 pm Post subject: Thanks, Chad. Anyone know a Seattle armorer to consult? I see what you mean about the junction as the location for the eye slits. That was a very amateur error I made. Are the metal plates around the slits, and down the nasal welded? If not, how were they attached? I figured they would have been riveted on because the armorers wanted to strengthen those vulnerable areas. I really need to handle a few good great helm reproductions, and make live sketches to get this right. Does anyone know of an armor maker in the Seattle area who makes good 13th C. - 14th C. helms? I know a lot of you who are in SCA are very good at researching. Please keep the feedback, and research tips coming. I suppose this will be a decent art piece for Norwescon after all. Although, art is meant to imitate life, not copy it like a photograph, this piece is fantasy, not history. I tried, and obviously failed, to maintain the hexagonal profile to the sword tip. The sword in my drawing is heavily foreshortened. It is not intended to taper like a XIIa. Type XII blades are heavier, and taper less than XIIa, but still have thrusting tips, yes? Can you point me to an example that clearly shows the configuration of the tip? I have done sketches of Maciejowski Bible illustrations. 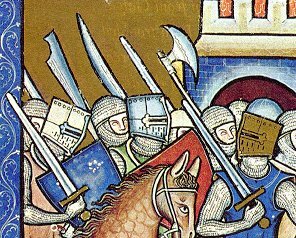 The era I am trying to illustrate is specifically England, 1260-1280 which includes the 2nd Barons War, and the 8th-9th Crusades. I suppose there are changes in helms, and blades even in those 20 years. And Chad? Thank you so much for your straight-up feedback. Personally I have never seen a leather rim on any sheld, but I'm no specialist in XIIIth. century. It does, however, seem very, very unlikely, especially in a configuartion that you have shown on the painting(which is gorgeous and makes me wish I had a 1/4 of your talent and skill). Leather was indeed used on shields, but usually in form of thin parchment leather that covered the entire front and back and was not visible under canvas and paint. Posted: Sun 12 Dec, 2010 5:18 pm Post subject: Re: Thanks, Chad. Anyone know a Seattle armorer to consult? The bands are riveted on, as you can see some and holes where others are now missing. Regarding Type XII vs. XIIa, you have some of it backwards. Type XIIa blades are hand-and-a-half or greatsword (basically 2-hand) versions of single-handed Type XII blades. They will generally be heavier than Type XII, because they are bigger. Both Type XII and Type XIIa have tips more tapered and suitable for thrusting than some earlier types, but are still less suited for thrusting than some later forms. It's a neat bit of art, for sure and much better than any drawing I could come up with. I just wanted to answer the OP's questions about the historical accuracy of it all. After all, they did state research from this site went into it and this is, after all, a site built on being a "Resource for Historic Arms and Armour Collectors." Posted: Mon 13 Dec, 2010 2:43 am Post subject: Oh, this is awesome feedback! THANK YOU! "Not many great helms have the metal reinforcing bands that are so often seen in modern reproductions." Uh, Chad, the Maciejowski Bible is loaded with helms that use those reinforcing bands. Maybe they were most popular in Poland? "There is at least one famous helm (dated to ca. 1280), shown in our great helm spotlight, that has the reinforcing bands...The bands are riveted on, as you can see some and holes where others are now missing." Chad! You Rock! I found, and then lost that image, but it was the one I was trying to copy for my illustration. Thanks so much for posting it here!. "A typical Type XII will not have a hexagonal section at all, but rather a lenticular section...Type XII spotlight...has many examples of this form. It's worth checking out." Oakeshott XII is lenticular. Good. Lesson learned. I'm still stuck on that sword tip configuration. I did some sketches from the spotlight article. i just blew it in execution--simple as that. I love that configuration chart. "I have never seen a leather rim on any sheld...Leather was indeed used on shields, but usually in form of thin parchment leather that covered the entire front and back and was not visible under canvas and paint." Hi, Christopher: It's nice to meet you. I stole that leather rim idea from a couple of members who posted shields they owned or made. They were both heaters, so I figured I was in the ballpark. I owe them each credit when I find their posts again. Were the shields always wood base, or did they use metal? As far as the use of that rim in the illustration, chalk it up to another example of artistic license. Thank you so much for the nice complements. As I stated, art imitates life, but it also tells a story. I believe some level of historical accuracy, will give more relevance to my paintings. Posted: Mon 13 Dec, 2010 5:26 am Post subject: Re: Oh, this is awesome feedback! THANK YOU! I was speaking of surviving helms at that point; sorry if I was unclear. By the way, the Maciejowski Bible is not Polish; it's French. It made its way from the French court to Naples, then to Poland, where it was owned by the Bishop of Krakow, Bernard Maciejowski (it acquired the name many know it by from its owner almost 400 years after it was written). From there, the book (which isn't even a full Bible -- just a collection of illustrated bible stories) made its way to the Middle East as a gift for the Shah of Persia. There is one Type XIIa in our spotlight that has a tip approcahed by a harder angle, but it's not the norm. Approaching the tip by more graceful curves is what's typical. Hello yourself It is indeed common for modern reenactors to reinforce their combat shields with various inventions such as leather rims, as it does help to elongate the lifespan of the shield when it is utilized against blunt weaponry. It is not however historically accurate. In your time period shield bases were always 100% wooden, made from planks glued or nailed together. As for the Maciejowski Bible, it is sadly true, we had nothing to od with it except for owning it for a while It is originally known as 'The Morgan Bible' IIRC. Some call it the Morgan Bible now because it is housed in the Pierpont Morgan library. It has also been called the Crusader's Bible and the Bible of Louis IX (thinking that he commissioned it). Is there a place where this book hasn't been or a person it wasn't owned by? Quite a story in itself. To me, it seems that the sword is way too short, given the angle at which it's pictured. Posted: Mon 13 Dec, 2010 6:07 pm Post subject: Sword too short? I hope I didn't mess that up. I was trying to get the sword to appear about 32 in. (81 cm) in length. The Features article showed that Oakeshott type XII swords ranged from around 30 to 36 (inches) long. I figured the knight might have been using that blade for awhile. If I missed that visually, the fault is mine. Thanks for bringing it to my attention, Paul. I'll keep trying. More fun info to catalogue in my brain, the travels of a French 13th C. collection of Bible stories. I still have time to fix that tip. (it might make the sword a bit longer too.) Sadly, the shield rim has to stay. It is used as a compositional device in the piece. Thanks for the clarifications, and continuing feedback, gentlemen. Posted: Mon 13 Dec, 2010 6:22 pm Post subject: Re: Sword too short? I hope I didn't mess that up. The spotlight quotes blade lengths, not the length of the entire sword. So a sword with a 30 inch blade might end up somewhere around 35 or more inches, give or take. Albion's Knight, for example, has a 31 3/8 inch blade, but an overall length of 38 1/8 inches. Posted: Mon 13 Dec, 2010 7:40 pm Post subject: Re: Sword too short? I hope I didn't mess that up. Now it's my turn to apologize for lack of clarification. I was trying to get "the blade" to look about 32" long. (I seem to recall about 32" is the type XII minimum blade length.) My statement was not meant to include the tang, which adds 4-plus inches to accommodate a full-grown man's hand. Add the pommel, and we're upwards of 39 inches for the entire sword. I can extend the blade tip to within 1/16 inch of the mat when I frame the piece on Tuesday or Wednesday. 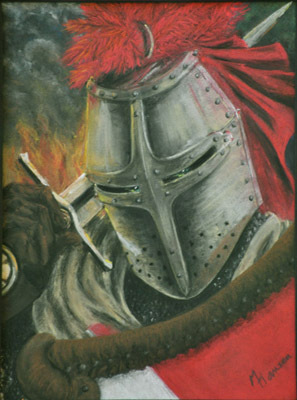 Posted: Tue 01 Nov, 2011 11:23 am Post subject: Figured I'd share my finished Feral Knight Pastel. The final painting looks more subtle in using finer brush strokes and closer to photographic reality than the first painting. It depends on your objectives as to style and realistic illustrative qualities i.e. there are historically so many styles of painting from photo realism to total abstraction to conceptual art that one can only judge the success of a painting if one knows the intent of the artist. That said I think it's better, at least to my tastes, than the first one at the beginning of this Topic. I think I have a good idea of period armour and arms but I'm certainly not an expert in the close details of period fashions to be able to spot any errors of construction, materials or style or time period of use, but overall this painting look good to me. My only comment from an accuracy perspective is that I don't think plumes/mantles etc. were used on helms for that period. I don't think they started to come into play until around 1300. Basing the helm off the Dargen helm (as in your 2nd pic) was a good call for 1280. <Edit> Just noticed the hand. Mail Mittens please! 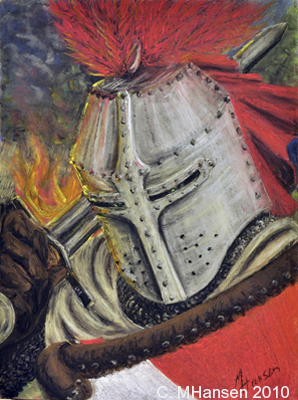 Posted: Wed 02 Nov, 2011 6:13 am Post subject: Re: Figured I'd share my finished Feral Knight Pastel. And now I like it even more! The plumage I think follows the Rule of Cool, and hey, maybe the maille mufflers/mittens are there, but just out of shot. Besides, hands are are to draw well at the best of times, so why not show 'em off!